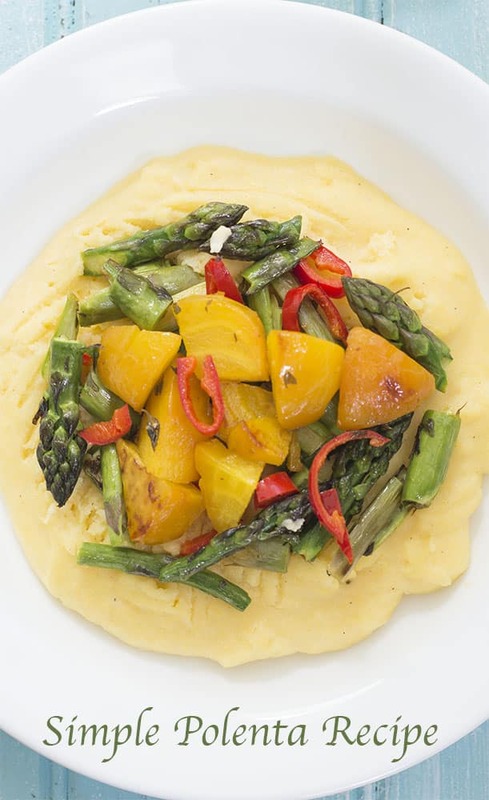 Simple polenta recipe made with fresh asparagus and gold beets in a sweet syrup. The asparagus give flavor and texture, beets add a sweetness. 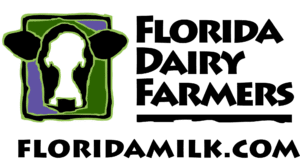 This post is sponsored by Florida Dairy Farmers in conjunction with a social media campaign through Sunday Supper LLC. All opinions are my own. Making polenta can be a little intimidating, but, it is not true! 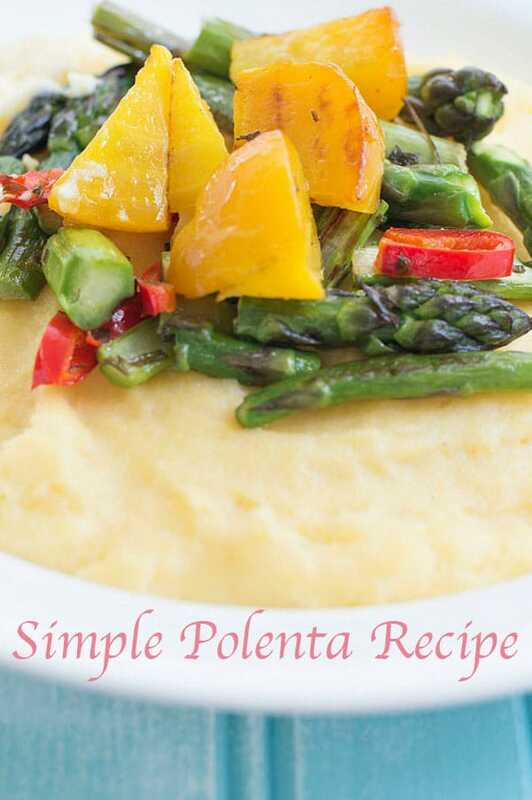 Polenta is one of the easiest Latin recipes you can make and use it in so many delicious recipes. 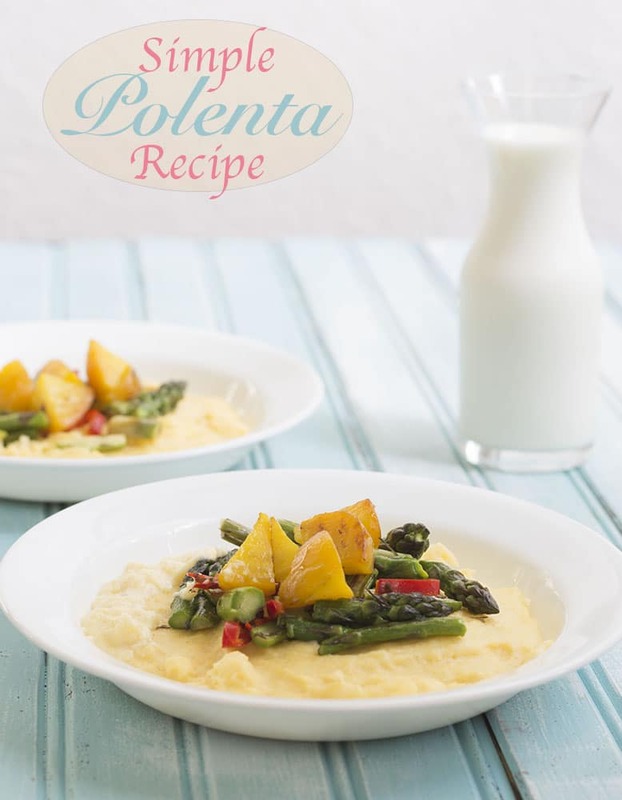 I have to confess that I had never made polenta until I made this recipe! I have eaten it at Italian restaurants and tapas restaurants all along the East coast. 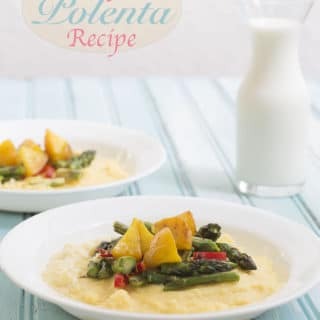 Now that I have discovered how easy it is to make, I am kicking myself for not making this simple polenta recipe before! The best polenta recipes in the world were always the creamy ones. As I researched this recipe, I found that the secret to getting the perfect creamy polenta is milk and baking soda! And its not just any milk! I am talking about the delicious pure, unadulterated 100% whole milk! Wouldn’t it be cool to meet the Florida dairy farmers that harvest the milk? 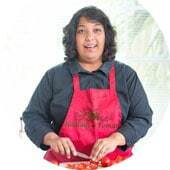 I visit their Meet Our Farmers websites frequently. They also have some amazing sweet and savory recipes that are so easy to make. The kid-friendly ones are very popular mainly because they understand what kids like. I could spend hours on the “On The Farm” life. They are definitely doing something right because they are catching the attention of the media. Click here to see how they are in the news. Florida Dairy Farmers are made up of more than 130 second and third generation farming families who own their own cows. Their herds range from 150 cows to 5000 cows. My mind is boggled at how much time and energy it takes to herd those many cows! To feed those many cows is a ginormous task. It is so nice to hear that they are fed 170,000 tons of citrus pulp, brewer’s grain, whole cotton seeds and other byproducts. I am sure if our landfills could talk, they would thank the farmers. Here is an even bigger mind blowing stat – 123,000 Florida cows produce 2.34 BILLION pounds of milk each year. Whew! Think of all the polenta I can make with that much milk! In our home, milk is used for so many reasons. The main reason is that we make our own yogurt using milk. Sure, we buy store bought yogurt but when we want to make batches of lassi or raita, it is cheaper to make it at home. Making yogurt is so easy. In addition to yogurt, we use it to make Kheer (rice pudding), pancakes, ricotta cheese and paneer. I felt that asparagus and gold beets would be a great flavor combination to the mild taste of polenta. To add a little spice, I went with red chili pepper. Together, it made this recipe sweet and spicy. The Florida dairy farmers and Florida milk folks are so accessible and they open up their lives on social media. I am completely mesmerized by their farm life and tidbits from their world. Follow them on social media to be entertained and informed by their captivating experiences. There are 2 key factors when making polenta. First, soak the polenta in cold water for about 1:30 hours. Second, add a pinch of baking soda to the cold water and polenta. It will help the polenta cook faster. Incidentally, did you know that Polenta is also known as Italian grits? Do not use cooked polenta for this recipe. Instead, find yellow corn meal in your grocery and use that instead. It is so much better than the cooked stuff. Thoroughly wash the gold beets. Coat them with a thin film of olive oil. Use a brush to coat it evenly. Use a fork to poke holes in the beets, then individually wrap them in foil and roast them in a mini oven at 400 degrees for 40 minutes or until you can easily stick a knife into it. If you have an mini oven that can go up to 500 degrees, use it. Cut asparagus into small pieces. Do the same for the red chili pepper. Be sure to remove the seeds from the chili. Cook for about 7 minutes. When the asparagus starts to brown, remove from heat and set aside. Make sure they remain crisp yet tender. Remove the polenta from heat and plate it immediately. Top with the asparagus and beet mixture. Note: Please serve this simple polenta recipe immediately after plating. Please serve this simple polenta recipe immediately after plating. You really have nailed getting that polenta so smooth and creamy. I think I have to try your technique. I LOVE polenta! This recipe is beautiful and that beet on top…too much! You call it simple, but I’d call it perfect! My sis-in-law’s fav dish was Polenta and every time I see it or enjoy it, it brings back such great memories. Such a beautiful dish, you did an amazing job! I almost made a polenta recipe for today’s theme, but then was slightly intimidated, so I am glad you did! I love the veggies you added to this flavorful dish! Thank you, Nichole. I was intimidated too, but, now that I made it I am really happy I made it. Your polenta looks so rich and creamy! Love the veggies you used too, what a great flavor and texture combinatioj. I’ve never made homemade polenta either, but I have made grits from scratch and I’m with you on the whole milk all the way. Thank you, Renee. I am not sure I can make grits, but, after this polenta I am sure going to try. Whole milk is the way to go. Great tips! The polenta looks wonderful!